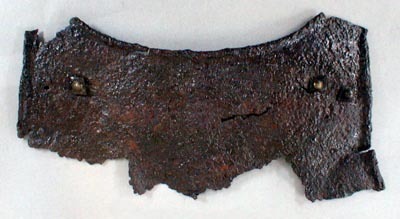 Breastplate —early 17th century. This is the neck and armhole section of either a breastplate or possibly a backplate. It measures only 11 1/2 ” from armhole to armhole and this appears small, but is probably within the range of an adult male of the time. It has the brass rivets with diamond-shaped washers for the shoulder straps that are found on many of the armor fragments in the DHR collections. This section was recovered from Jordan’s Journey, an early 1600s settlement site in Prince George County near Hopewell, Virginia.